This title includes the tyrannosaurus and triceratops, as well as less-familiar creatures. It is aimed at children aged 5 and upwards. This teaches aspring artists how to draw with ease by following simple, step-by-step instructions. Celebrated author Lee J. Ames has compiled an amazing array of creatures who, at one time, ruled the earth. Included in these pages are the commonly known tyrannosaurus, the brontosaurus and the triceratops, as well as less-familiar creatures, such as the anatosaurus (a duck-billed dinosaur). Ames' illustration style and renowned drawing method had made him a leader in the step-by-step drawing manual, and the 27 books in his "Draw 50" series have sold more than 3 mililon copies. 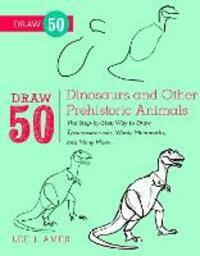 It's easy to draw dinosaurs and other prehistoric animals when it's done the "Draw 50" way.